Background: this is corydoras eggs and planorbus snails. Quick question, can you guess what is about to happen? I'm curious. Francois, do you see the snails ever eating an egg or two as Gary has? @ksimdjembe wrote: I'm curious. Francois, do you see the snails ever eating an egg or two as Gary has? Why do you want my snails to hurt, even if they do starve in egg cup I like them?! ? But yes, I have seen some time some unfertilized eggs disappearing, but it is very rare. Most often when I do not see any egg disappearing, they all hatch out, so when no one disappeared they are all fertile. It is not easy to follow each egg one by one, but my feeling is only damaged or infertile ones could disappear (white eggs that will be present in one evening and absent the day after.). By the way the third F.gresensi egg has hatch yesterday! I'm going to have another go at this experiment. I will use eyed up, fertile eggs this time, because it is altogether possible the snails just cleaned up. It isn't something I would use as a technique with my fish, because of the long incubation times. For a fish that hatches in 48-72 hours, these beasts may be useful, but the amount of crap in the egg containers is deadly - snails in incubation containers aren't practical for me with rainbows or killies. I may become less of a figure of horror for snails after this though. My shadow may not mean doom. You know, I can't test this, but killie eggs are soft for a few hours after they are attached to plants or a mop. If you pick them too soon, they burst, as the shell is a thin membrane at first. I wonder if the eggs were at that stage when I saw snails eating them? Maybe the chemical defenses against snails I've read about become active with the hardening of the shell. Anyway, I will take some eggs I don't plan to raise and try them in larger containers, so I can deal better with the wastes. Cherry Shrimp are also great to have in tanks with eggs, they will clean them and also remove the non fertilized eggs! Wow this is a very interesting thread and has taken some of my concern away from having snails in with eggs. Still not a fan of them though. Yes, use your players at what they are best at. Ramshorn snails are scavengers and you are the water guy. I use them to clean eggs from algae and fungus and I do as much water change daily. That way they take care of keeping eggs clean and I do take care of keeping water clean. Not all snail poop are going with water change, since water is 90-100% clean it does not affect negatively eggs development. So far it has been reproduce indepently on Corydoras CW010 (orange laser) in Washington DC and Edmonton AB, and on Corydoras boesemani and Corydoras carlae still in Edmonton AB, and as mention earlier on some killie eggs (possibly Rivulus hartii) in Montreal Qc. @l_l_l wrote: You know what? I got the same feeling and I did mention it in my presentation. Cherry shrimp do not harm eggs, I put some Corydoras CW010 with cherry shrimps and ramshorns and they did hatch well. I saw shrimps going on the eggs but as there was snails too I could not conclude which one was the best for cleaning. Gammarus (scud) will also do the job I tested them on cory CW010 and it was indepently reproduce on Aspidoras albater eggs in Montreal. I do not like much the use of these shrimps as I do daily water change and snail stick better during water change, shrimps tend to go with water into the sink... Which eggs species have you tested with cherry shrimp? Very good discussion here on egg cleaning. I presume that the cleaning of eggs removes the attachment of fungus and the extraction of dead eggs, reducing the amount of source of fungus that can be circulating in the water. I like the idea of shrimps and gammarus cleaning eggs. I like the idea of snails cleaning eggs. Francois : do you still need to add methylene blue / malachite green to the water? If not, this may be the best advantage as a non-medicinal way to hatch eggs. So many species are susceptible to these fungicides and it would be a good practice to use fungicidal organisms to control rather than chemicals. 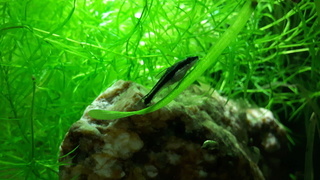 @francois wrote: Which eggs species have you tested with cherry shrimp? 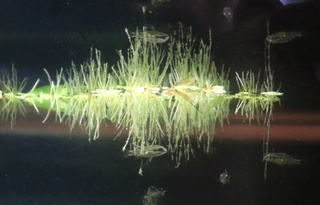 I have tested with tateurndina ocellicauda eggs that were in a tube without the father to fan them. Shrimp were doing a great job and got great numbers of fry making it out of their eggs. I never use Methelyne blue or malachite green (or acriflavene) for any eggs, btw. I've read an article about several breeders linking the use of Methylene blue to swim bladder disorder in some fish. I would never use it because of that. @alexmtl wrote: Francois : do you still need to add methylene blue / malachite green to the water? @l_l_l wrote: I've read an article about several breeders linking the use of Methylene blue to swim bladder disorder in some fish. We use Methylen blue in lab as dead cell marker. This dye enter the cell passively and get expulse out in an ATP (cell energy) dependent mechanism. If the cell is dead no more energy and it stays blue. It may have additional side effect as it is used to stop bacterial and fungal progression, not sure if it is the same mechanism as for in vitro cell culture. Congratullations for the Tateurndina ocellicauda. When I bred them I used to calculate how many days it was taking before they hatch, and was removing the tube just one or two days before hatching, so dad was taking care of the eggs and I was taking care of fryes. Fryes are very difficult to feed at first so tiny, which was a surpise, so large eggs and so small fryes. I was not very good at my job, I saved only 12 of them. 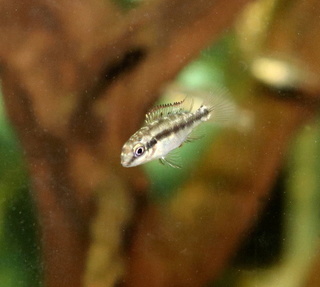 The young corys whose eggs were cleaned with snails are growing. I won't use snails to clean my killie eggs, because the amount of work involved in cleaning their enormous waste production is not worth it, given the return. I don't have a problem with eggs dying here, right now. This experiment has me thinking about snails a little differently though. Today when I found some killie mops full of pond snails, I removed them without swearing or malice. I then had a short ceremony, apologizing to the snail gods for the things I had done in the past, out of ignorance. To make the ceremony complete, I then sacrificed all the captured snails to my Steatocranus. It's never too late to reform. @francois wrote: The young corys whose eggs were cleaned with snails are growing. Wow that is a lot of corydoras!! Glad they are doing fine. Ya, a lot... they might be over 100 in a 5 gallons, with air sponge filter, food at will and near 80% water change each two days. They may find their way to a 20 gallons soon or to get their water change daily. @francois wrote: Ya, a lot... they might be over 100 in a 5 gallons, with air sponge filter, food at will and near 80% water change each two days. They may find their way to a 20 gallons soon or to get their water change daily. Well, if you ever feel overwhelmed, send some my way ? Just to share with you, I tested what I believe are pond snails versus ramshorn snail. I took 18-19 eggs from Corydoras schultzei (called black venezuelanus) and 7-8 eggs of corydoras panda, and mix them with either pond or ramshorn snails. 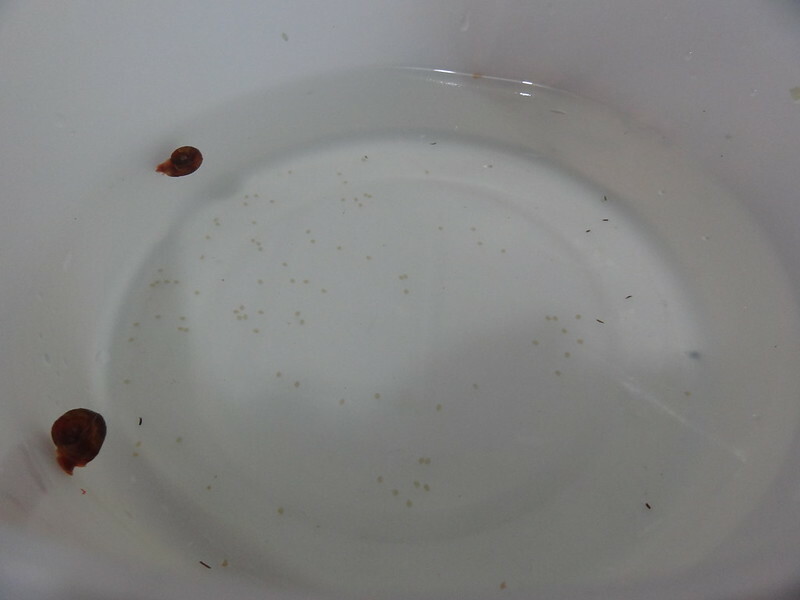 Results: only 3 hatch with pond snail and near 20 with ramshorn snails. On this picture there are still some to hatch and some already out of their egg shell. White fry are C.schultzei and darker one are C.panda. 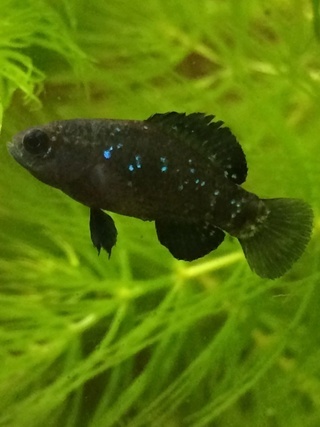 I noticed that before C.panda eggs darken as they develop and fry hatch almost black. Some update of fishes whose eggs were succefully protected by Ramshorn snails. 20 catfish: 17 cory type, 1 Aspidoras, 1 Scleromystax, and 1 ancistrus. 2 non catfish: 1 killie and 1 cichlid (angel fish). Well, that didn't work too well. I had put about 30 eggs in there that were all eyeing up so fertile. The second day, many of them had fungused but I was still able to get about 5 wrigglers. Yesterday, there were only 2 wrigglers left and today none. Just got success with 4 Fundulopanchax nigerianus Rayfield eggs. Got the 4 eggs out of the mop, incubate them with small size snails for 2 weeks with daily water change and got 4 wringlers between Monday and today Wednesday.